View my commission information and fees. Email me an enquiry or send me a message. SOURCE MATERIAL - to create my art I work from photographs. These can be scanned and emailed (high resolution at 300ppi preferred), sent through the post, or using the Photo~Mailer facility below. For best results make sure photos are taken at the subject's eye-level and as sharp as possible. Anything under 3" in photo size will diminish the final quality of the commission. The more information I have to work with, the more lifelike the end result. All photos are returned upon completion. These prices do not include shipping/handling. TIMESCALES - Most work is completed within 7-10 working days upon receipt of reference photographs. Ensure a few days either side to allow for shipping. For special occasions (ie birthdays/anniversaries/Christmas) please book in advance to avoid disappointment. ORDERING PROCESS - I will require a 50% deposit together with the reference photographs. 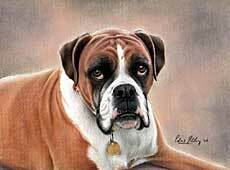 The following 50% is due upon completion and acceptance of the finished artwork, prior to shipping. I shall supply scanned updates for customer approval. PAYMENT METHOD - I accept payment through cheque, payable to Giles Illsley or credit card via PayPal. Please do not pay in cash as I cannot be held responsible for it's safe arrival. FRAMING - Framing is available for collection only. Please for prices and details. Commissioned as a wedding present - the ideal gift. 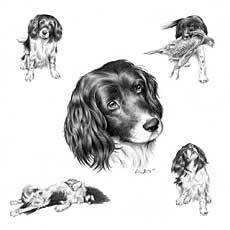 Commissioned montage portrait of a well loved Springer Spaniel. Summer - a Rottweiler commission. Click browse to find the location of image file you want to send.